The year is 1992, and Dr Bill Brockton is a professor of anthropology at the University of Tennessee. He frequently assists the police in solving murder cases. He has just hit upon the idea of using a vacant patch of ground and corpses to study the details of how the human body decomposes. However, the cases he’s working with the police are inceasingly starting to remind him of cases that he’s solved in the past. Is someone killing to send him a message? Is his family in danger? Dr. Brockton must use all the knowledge at his disposal to solve this string of grisly murders before it is too late. 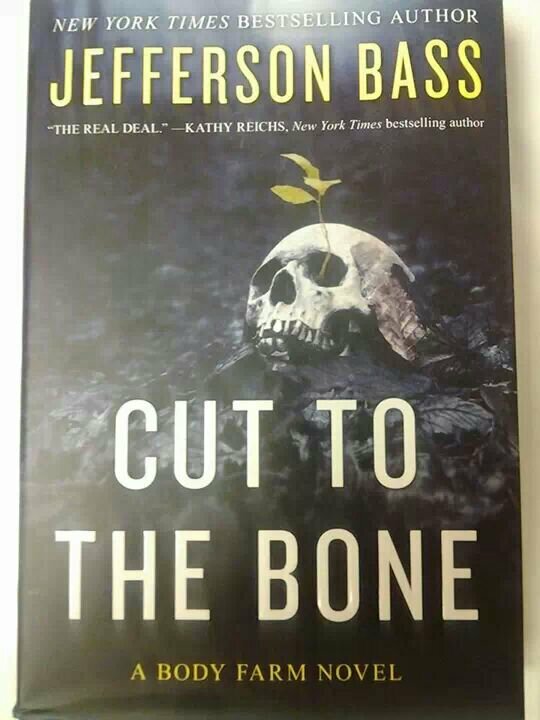 Cut To The Bone is a prequel to the other novels in the Body Farm series, based on the real-life Body Farm at UT. Although the timeline was fudged a bit, it was fascinating to take a peek back at the beginnings of forensic science, when things that are standard practice now were experimental and exciting- like an artist’s reconstruction based on a skull, or using blowfly larvae (aka maggots) to determine time of death. The Body Farm novels always do a good job balancing the action of a mystery with the technical forensic details- and keeping it in approachable terms. Cut To The Bone goes beyond the questions of who did it, and how, to explore the why. This novel refers to the Biblical story of Adam and Eve, and the serpent in paradise, to address the issue of evil in the world. I don’t read many forensic novels where a character consults their pastor (I don’t remember it anywhere in this series either) but I appreciated the depth added by a spiritual and moral perspective. I also enjoyed the portrayal of Dr Brockton’s relationship with his son and wife. It is sadly rare to read a novel featuring a loving marriage between two people who, even after decades together, share respect, care, and yes, sexual attraction. Any Body Farm novel is a good read for fans of forensic mysteries. But I think the authors have outdone themselves with Cut To The Bone. The characters, relationships and moral depth make this much more than your average forensic mystery. Other good forensic mystery authors: Kathy Reichs, Jeffery Deaver. This entry was posted in Fiction and tagged body farm, book review, forensics, murder, mystery. Bookmark the permalink. In your opinion, do the Body Farm novels have to be read in order? Or could you just pick up any book in the series and not miss anything important? No I don’t feel they have to be read in order. I think the authors do a good job of filling in the details with each book. If you’re new to the series Cut To The Bone is a great place to start since it is sort of a prequel!